If you have bat activity on your property, there is a very good chance that you will come across some guano. Bat guano has many positive impacts when used as a fertilizer, as it enriches and improves soil to grow crops. It is even a frequently utilized in villages and tribes all over the world for weapon crafting, building homes, fertilizer, and more. But when it comes to human exposure, bat droppings are not something you want to mess around with, nor be around at all! Continue reading to learn more about guano, including how it can cause health implications in both people and pets. Bats like to roost in private, sheltered locations that are dark and cozy. Attics are a common site to find a bat infestation, and a good place to start an inspection if you suspect bats are in your house. Chimneys are another hot spot, as well as, roofs, gaps in siding, barns, and log piles. When it comes to spotting guano, the entrances and exits to these roosts are where you will find the most accumulations. Bat droppings are often found around window sills and door frames, or next to ledges, rooftops, and tall trees. The problem with bat guano exposure are the fungal spores that it develops overtime. These fungal spores, known as Histoplasma Capsulatum, can become airborne and travel through a residents vents, ductwork, and more. The airborne spores can be inhaled by both people and pets, which can lead to an infectious lung disease called Histoplasmosis. Histoplasmosis is referred to by many names, such as Spelunker’s Lung, Cave Disease, Darling’s Disease, or scientifically, Reticuloendotheliosis. The people who are most at risk for developing this illness are spelunkers, chimney cleaners, cave miners, and people that frequent attics and crawl spaces often. However, it is possible for anyone in the presence of such spores to develop the condition as well. If you come across some guano, just be sure to keep a safe distance to avoid any contact. Your next step is to have the area inspected for bat infestations, and then remove any bats living on your property. From there, you will need to have bat proofing strategies implemented in order to prevent further infestation or exposure. A licensed Louisville bat removal and control company can provide all of these services, including bat cleanup and attic restorations. 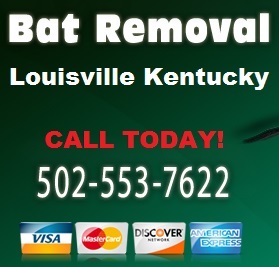 Call 502-553-7622 for Louisville bat removal services you can trust. We are DNR licensed and insured bat control contractors who use safe, non-lethal methods of extraction and exclusion. We serve both residential and commercial clients, and at the most competitive prices in town. Emergency 24 hour service is also available. Request a free estimate, today. This entry was posted in Bat Diseases and tagged bat guano, Guano dangerous, Guano facts, Histoplasmosis bats, is Guano toxic, Louisville Bat Removal and Control. Bookmark the permalink.